Cover art by Cyndy Szekeres. Includes coverage of Halloween-related subjects. 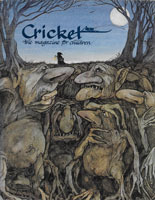 Cover art by Wendy Watson. Includes contributions from Isaac Asimov, Martin Gardner and Jack London. Cover art by Jenni Olover. Includes contributions from Isaac Asimov, L. Sprague de Camp and Peter Dickinson. Cover art by Jan Pienkowski. Includes some coverage of Halloween-related subjects. Cover art by Friso Henstra. Includes contributions from Mary Norton, Manus Pinkwater and Theodore Roethke. Magazine is Fine Plus save for mailing label on front cover. Cover art by Hilary Knight. Includes contributions from Felice Holman, Carl Sandburg and John Daniel Stahl. Magazine is Very Fine Minus save for mailing label on back cover. Cover art by Imero Gobbato. Includes contributions from Jan Adkins, Joan Aiken and Mercer Mayer. Cover art by Trina Schart Hyman.